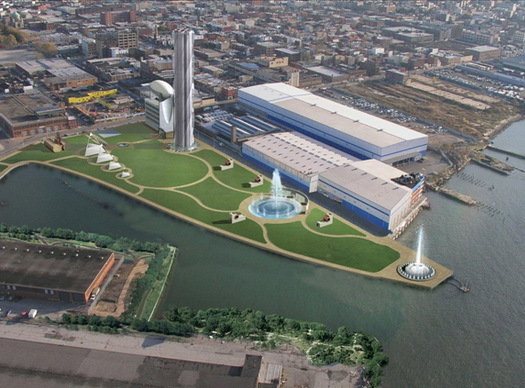 If you thought the proposal for a big underground power plant in Williamsburg that would be built by Transgas at the Bushwick Inlet was killed in 2006, you're wrong. If you thought it died in 2007, well, you're wrong again. 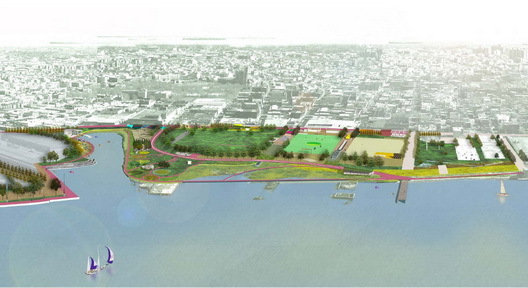 The Power Plant with Nine Lives is still technically alive, and there is yet another hearing coming in Albany to determine its fate and that of the big waterfront park that would stretch from East River State Park to the north of the Bushwick Inlet. Yesterday, Daily Intel posted about a proposal made by Evan Thies, Council Member David Yassky's former aide who is running for his old boss's seat next year. Mr. Thies suggests that the city could clear some land on the 28-acre park site and use it for big outdoor concerts starting in 2009. Those following this saga know that this is the last year for concerts at McCarren Pool because it is being returned to use as pool. Everyone has promised to look for some waterfront land to stage concerts, but the trick is finding a spot where neighbors won't be upset and where the use conflict with other plans. The parcel proposed by Thies wasn't identified, but the only land we can identify that could be cleared in 18 months and used for shows is immediately north of East River State Park (and within listening distance of new condos like North8 on Kent Avenue). Unless some land in Greenpoint is being suggested. Regardless, nothing can happen park-wise until the TransGas issue is settled once and for all, and to this end, the obscure State Siting Board is meeting on March 20 in Albany. In the meantime, the Open Space Alliance of North Brooklyn has an online email campaign to "Send a message to our state government in Albany to let them know that we demand a PARK not a POWER PLANT." 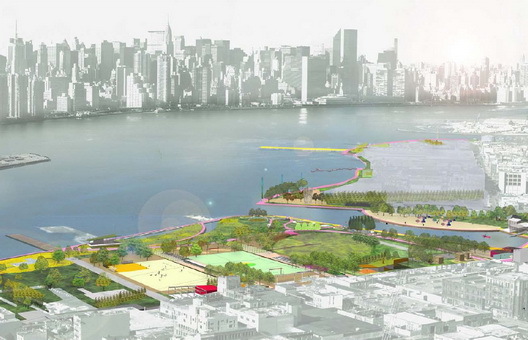 The bottom rendering is one of the waterfront with gas. There is a proposal in Albany to take the land via eminent domain.